As change nips at the edges of the Bronx, the borough’s iconic auto-glass workers continue their daily street-dance. David is one of the dozen men standing in front of the row of auto repair shops on Garrison Avenue in Hunts Point, a bustling Bronx neighborhood that juts into the East River like a child sticking out its tongue. At times, the men are like sentinels guarding the entrance to the shops, the entrance to the Hunts Point peninsula. Mostly they are like hyper Wall Street traders, wildly waving their arms, jumping around and shouting out, “Auto Glass!” to lure cars into their respective shops. “Just as long as people have cars and those windshields break, they have to get them fixed. It’s the law, right?” says David. David is what is known in Bronx argot as an auto-glass worker, and like the other men, he makes his living chasing cars and striking deals to have shattered windshields, cracked mirrors or busted taillights replaced. For four decades, these men have become iconic in Hunts Point, symbols of the neighborhood’s struggle as much as its resilience. Local lore dates their emergence to the early 1970s, around the time things started to go south for the neighborhood: not long after Hunts Point was cut off from the rest of the Bronx by Robert Moses’s aggressive plan to build the Bruckner Expressway, and when redlining and disinvestment by the banks and government was turning the Bronx into a national symbol of urban blight. Hunts Point, like the rest of the Bronx, was left to fend for itself. The auto glass and repair industry rose despite, and because of, these conditions. It’s a slow moment in a busy day and David pauses to look down the wide street. From inside Master One Auto Glass salsa music plays so loudly that the men working shout to one another to be heard. One man dances by swinging his hips to the tropical rhythms. Then he smiles, nods his approval of the percussive beats, and returns to replacing a side view mirror. The clank of metal against metal and the puffs and whirs of air tools punctuate the music. Out of the corner of his eye, David catches a car with a dangling side view mirror. He calls out to his buddy across the street. “Yo! Yo! The blue one. The Buick.” His buddy flags down the car and swoops in to make the deal. These men come from all walks of Bronx life—some worked in maintenance, some did time in a local prison because of a drug dealing past, some have tried job training programs, and most have children and “baby mamas,” but not high school diplomas. The group assembled on Garrison Avenue between Hunts Point Avenue and Barretto Street are all Latino—different shades, different ages, all straight-appearing and macho, though one young member admits that he is bisexual. By 1997, when he started getting into the auto glass business, there was order. They developed a system to share the cars so everybody gets paid. Now, it’s like a tight family. David knits his hands together over his heart to emphasize his point. They’ve all got their piece of the pie and their area of expertise and no one can join their ranks unless brought in by someone already there. Still, life in the auto-glass trade is not an easy one. “I don’t know how much longer I can be doing this. I’m out here 6 days a week from about 9am to 6pm. I started when I was 15. Now I’m 31. I need a change,” David says. David has been saying he needs a change for several years now. He once saved up $10,000 and was going to open up his own shop in New Jersey. Why Jersey? An opportunity presented itself. He didn’t invest and is still on Garrison Avenue. Much like David, Hunts Point has been doing its own dance with change during the last decade or so. 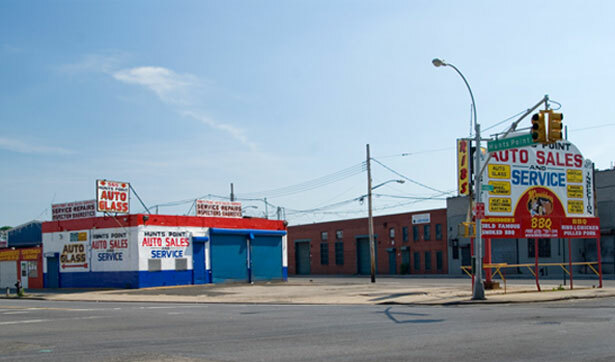 It is still one of the poorest neighborhoods in the poorest borough in New York City, but affordable housing, neighborhood development programs and community-based cultural centers have all risen like grass from concrete to join the auto glass business as neighborhood industries. But change can be a funny thing. Now that the neighborhood is recovering from the shadowy seventies, thanks to community efforts, developers like Taconic Investment Partners and Denham Wolf, which bought the legendary American Bank Note Building on Garrison Avenue and Tiffany Street, have professed big plans to bring in creative industries. They claim that the economic downturn in 2008 slowed their original plans, and five years after they purchased the Bank Note building—and raised the rents which displaced the artists who were in the building—they haven’t brought up many architects or artists. The biggest tenant preparing to take up roughly half of the 400,000 square foot structure is New York City’s Human Resources Administration known locally simply as “The Welfare,” which serves the city’s poor with rent subsidies, cash stipends, food stamps, and other services. As the snow continues to fall, David trudges back and forth to three different shops trying to find the right taillight for an old Chrylser—no luck. He has to go further into Hunts Point to find it. The car owner shrugs and goes into his car to wait. Then, David slogs along Garrison Avenue as the snow falls heavier. He returns with the right part. The customer drives off satisfied and David flashes his gap-toothed smile. As parts of Brooklyn gentrify, neighborhoods like Brownsville are left wanting for a less superficial form of revitalization, Ginia Bellafante writes. Read all of the articles in The Nation’s special issue on New York City. Charles Rice-GonzálezCharles Rice-González is a writer, LGBT activist and Executive Director of BAAD! The Bronx Academy of Arts and Dance. His debut novel, CHULITO, is about a young Latino man, coming out and coming of age in Hunts Point.